Laci Peterson, who dissapeared on Christmas Eve day, 2002, was due to give birth to her son Conner on February 10, 2003. (CNN) -- Until she vanished, Laci Peterson lived in near anonymity. It took her disappearance, and subsequent death, to put her in the spotlight. Before Christmas Eve 2002, she was a pregnant substitute teacher with a white-bright smile and dimpled cheeks from a modest California neighborhood. But the circumstances of her disappearance -- the holiday season, her pregnancy, a case with few clues and a closed-mouth husband -- made her the subject of national concern and conjecture. That increased when her corpse and that of the unborn son she planned to name "Conner" washed ashore four months later, near where her husband said he was fishing on Christmas Eve, the day she disappeared. "One of the great mysteries about the Peterson case is why the public ... responded to it so passionately," said CNN legal analyst Jeffrey Toobin. "... It doesn't have a celebrity involved, no one had heard of these people before, but there is something about it that has grabbed many thousands of people." Born May 4, 1975, Laci Denise Rocha grew up in Modesto, California. In that midsize city with a small-town feel, she had a reputation as a gregarious girl with a sunny disposition. She was "always smiling and bubbly and talkative ... usually the center of attention," said Stacey Boyers, a childhood friend of Laci's. Laci Peterson's teenage years were described as that of an "all-American girl." "She was a cheerleader at the high school. She was vivacious. She was outgoing and friendly," said Anne Marie O'Neill, a reporter for People magazine. "Her stepfather used to call her 'Jabber-jaws' because she talked so much." After high school, Peterson, who'd developed a fondness for cooking and gardening, enrolled in California Polytechnic Institute in San Luis Obispo as a horticulture major. In that city, she met Scott Peterson, an athletic man from San Diego who loved hunting and fishing. Scott was a Cal Poly student and an employee at a cafe that Laci Rocha frequented. Laci had a friend give her number to Scott and he called right away. Their relationship became serious quickly, friends and co-workers recalled. They were "like teenagers in love," said Laci's high school friend Renee Garza. Scott tried to impress Laci's mother when she visited the Pacific Cafe. "He asked me to make a special appetizer for them," said Abba Imani, owner of the cafe. "Scampi, if I remember right, and he had some flowers on the table." Imani described Scott as a "very good worker, very responsible -- but most importantly, a very polite person. People really liked him." The couple's courtship culminated in an elaborate wedding. Imani recalled: "It was a gorgeous day in Avila Beach, outdoor wedding, perfect. Everything was just right... nice couple... they were perfect for each other." 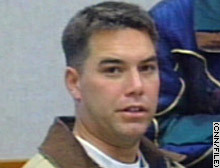 Scott Peterson was arrested in San Diego by Modesto police on April 18, 2003. The newlyweds opened a hangout spot called "The Shack," which gave students from their alma mater a place to get good food cheaply. They found success and fulfillment in "The Shack," but the couple decided to move back to Modesto to be closer to Laci's family and start one of their own. They were happy when Laci conceived after trying for a while. 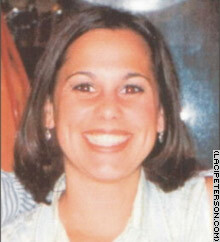 "She and Scott were thrilled about the coming of a baby boy," said Susan Caudillo, Scott Peterson's sister. "Everything in their life that they had planned for the past five years in their marriage was coming and everything was going wonderfully." That's why Scott Peterson's Christmas Eve phone call saying Laci was missing was such a jolt. Scott Peterson said he went fishing at a bay 85 miles away from Modesto while his eight-month pregnant wife planned to finish shopping on Christmas Eve..
"They were all ready for Christmas, their presents wrapped, their plans laid," said Jackie Peterson, Scott's mother. "It's just like Laci to let Scott go do what he wanted.... That was their little agreement and it was only a few hours. It should have been fine. But it wasn't fine. Hours passed with no sign of Laci, and the family sprang to action. They pleaded for help on the airwaves and put pictures of Laci on every tree, window and lamppost in sight. The community responded by scouring parks, rivers and ravines to find a trace of Laci. Laci's parents and siblings appeared on television day and night. Scott Peterson was notably absent. "Scott ... was real standoffish, didn't want us to take his picture, didn't want us to interview him," said Ted Rowlands, a reporter for KTVU station in Oakland, California. A week after her disappearance, the community held a candlelight vigil. Scott Peterson's behavior raised eyebrows. Videotape of the vigil showed Scott Peterson laughing and joking with friends and taking a cell phone call while the rest of the family was sobbing. Scott Peterson subsequently made frequent out-of-town and overnight trips and remained steadfast in his refusal to speak to the public. "For better or worse, the public seems to have kind of a script for how bereaved relatives ought to behave," Toobin said. "And he didn't follow that script. He was not quite sad enough." Later, after a woman identified herself as his mistress, Scott Peterson admitted he'd cheated on Laci. On April 13 and 14, passersby found the body of a near-term fetus and the partial remains of a woman near Point Isabel Regional Park, in Richmond, California. The remains were about two miles from where Scott Peterson told police he went fishing on Christmas Eve and about 80 miles northwest of their Modesto home. Considering Scott Peterson a flight risk, police arrested him on April 18. He had $10,000 cash on him, had colored his hair blond and was carrying his brother's identification. Police later charged him with Laci's murder. DNA testing revealed the corpses were Laci's and Conner's, but the autopsy could not determine a cause or time of death. With confirmation of the bodies' identities, Laci's family held a final press conference. "... My heart aches for her and Conner. Without them, there's a huge void in my life," said Sharon Rocha, Laci's mother. "... I literally get sick to my stomach when I allow myself to think about what may have happened to them. No parent should ever have to think about the way their child was murdered.